MSN Plus was a popular add on for MSN Messenger (Windows Live Messenger) throughout the 2000’s. One of the features MSN Plus had was the ability to log chats, then in later versions of MSN Plus encrypt these chat logs. Encrypted chat logs we’re certainly a good idea, however as the years go on things change. MSN Messenger has long since been merged with Skype and development of MSN Plus has ended. So what can I do about the all the encrypted chat logs I have spanning almost 10 years? It’s still possible to view the chat logs if you install an old version of MSN Messenger, which will then allow MSN Plus to be installed so your encrypted chat logs can be opened as normal. To me installing two programs which are no longer supported (and not even possible to download unless you have archived a copy) was certainly not ideal in my mind, so I wanted to find a way to decrypt all my old chat logs. As it turns out back in 2006 a MSN Plus community member going by the alias of CookieRevised created a batch file that would decrypt (or encrypt) all MSN Plus chat log files found within a folder / sub folders of that folder. 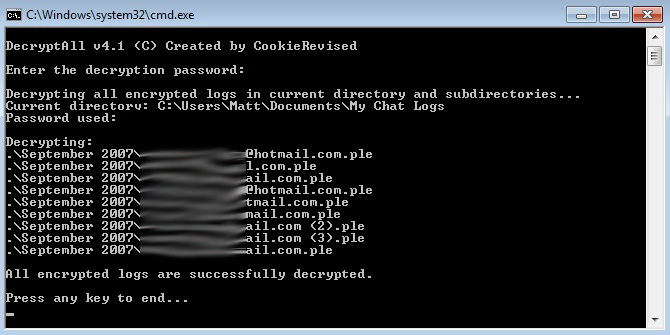 Providing you know the password used to encrypt your chat logs this script can scan through your chat logs folder, locate any .PLE files (Encrypted chat logs) and batch decrypt them back to the standard .html chat logs MSN Plus used for non encrypted chat logs. The process is pretty easy to do presuming you have an offline installer for MSN Messenger and a compatible version of MSN Plus. If not I have uploaded a copy of everything you will require below. I have created mirrors of the above files from my download archives as none of them appear to be hosted online anymore, all the files were sourced from their official sites many years ago. Note: I installed the above on a Windows 7 SP1 64bit virtual machine which i can confirm this process will work on, newer versions of Windows might not be compatible. Extract the DecryptEncryptAll batch files to the folder your chat logs are located in – Documents\My Chat Logs is the default location. Once decrypted the encrypted chat logs will be deleted and you will end up with the standard MSN Plus HTML versions of your chat logs in the same folder the encrypted chatlog was located in. To decrypt all my chat logs it took around 20-30 mins (I wasnt really watching it), this will vary depending how many logs you have saved over the years. My chat logs were encrypted from September 2007 onward to December 2011. I believe December 2011 was around the time I switched over to Trillian as i didnt really like the look of the newer MSN clients, however at that point Trillian was still capable of connecting to the Messenger network and was a much nicer client than in my opinion. I hope this helps some fellow MSN users out, I think old chat logs are something good to keep and look back on in years to come to see what I was doing in a certain point in my life, even just looking back at a few when posting this blog i was thinking “wow i totally forgot about that”. If you are from the UK you likely grew up with MSN Messenger, it’s something I had used since the year 2000. Back when I was in school or college you would just ask someone for their MSN email address, rather than a mobile number. Back then not everyone had mobile phones and for those who did calls / texts where not usually free, so most people would often be on MSN during the evenings. The modern day equivalent seems to be WhatsApp / Facebook messenger. Anyway i’m going a bit off topic here, i hope someone find’s this blog post of some use sometime in the future! Note: the source for the batch script used in this guide was the MSN Plus forums, which now no longer appear to exist. A community hosted archive of the MSN Plus forums can be found here. The batch file used in this blog was found in the archived topic here. i’m surprised at how well this worked, parallelization in the original script would’ve been nice but it’s better than nothing. I don’t know if anyone is still replying here but i need help. I don’t remember the original password i used to encrypt my chat logs back in 2010-11 I have changed various time the password of my account linked to those chat but i dont remember the initial one associated with the logs is there anyway i can decrypt or open them i tired installing messenger live but it doesnt work plz help!!!!!!!!!!!!!!!!!!!!! All you can really do is keep trying to guess the password unfortunately, the chatlogs and encrypted and the password you set is needed to decrypt them. Unless theirs some flaw in the way Chatlogs were encrypted all you can really do is try to bruit force the password and guess it. You could contact Patchou, the creator of MSN Plus: http://www.patchou.com/about/contact/ – however i’m guessing all he will do is tell you the same unfortunately.